"Fault in Our Stars" Birthday Party for Kaley - Who Said Nothing in Life is Free? Today is Kaley’s 17th birthday party and I just can’t believe how fast time has flown by. It seems like just a few years ago she was my little girl and now she is almost an adult. 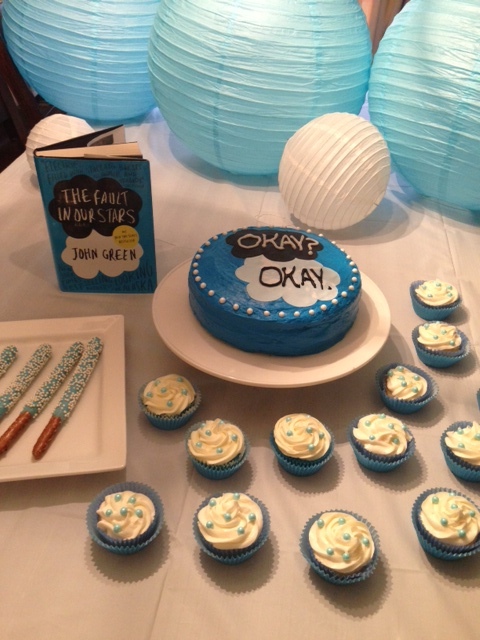 This year she wanted to do a “Fault in Our Stars” themed party so I wanted to share all the fun goodies I made for it. Almost all of these things would also work well for a Disney Frozen themed party !!! I will be doing a separate post on how to make this cake because with the Fault in Our Stars movie coming out soon and I think this will be a popular cake for teen girls. And let me say, if I can make it, anyone can. I absolutely LOVE the blue paper lanterns from Oriental Trading. They come in packs of 6 and you can choose different sizes (I got 18 inch and they are HUGE). They added such a fun touch to the party. I wish I had gotten the Turquoise Paper Streamers but totally didn’t think about ordering them when I was picking out stuff. 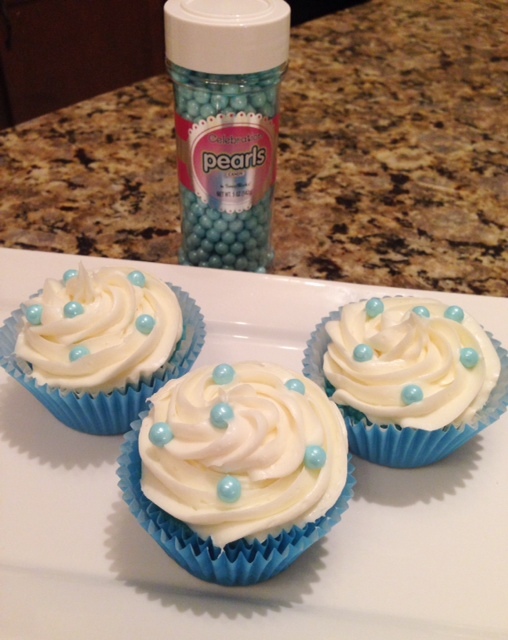 The cupcakes were very easy to make (box mix) with vanilla icing and Sweetworks Shimmer Powder Blue Pearls added to the top. I think they turned out so pretty ! 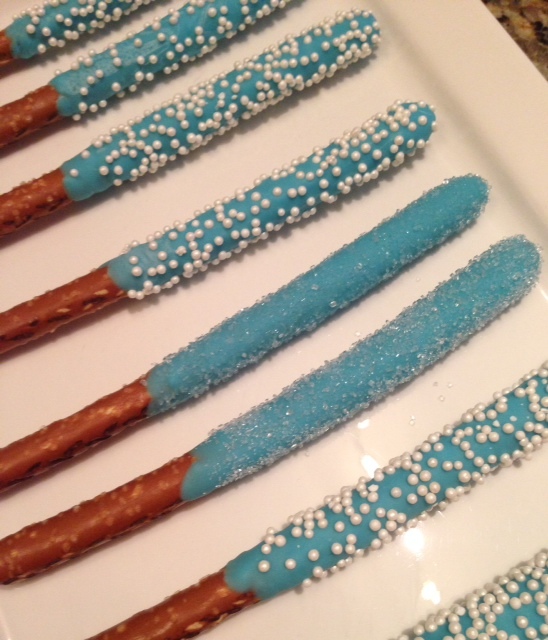 And the last thing on my cake table was the chocolate dipped pretzel rods that I posted about HERE. I have to say, this was my favorite part of the party. I really love all the blue and white candy that I found for it. What I love about Oriental Trading is that you can sort by color so you can find exactly what you are looking for. 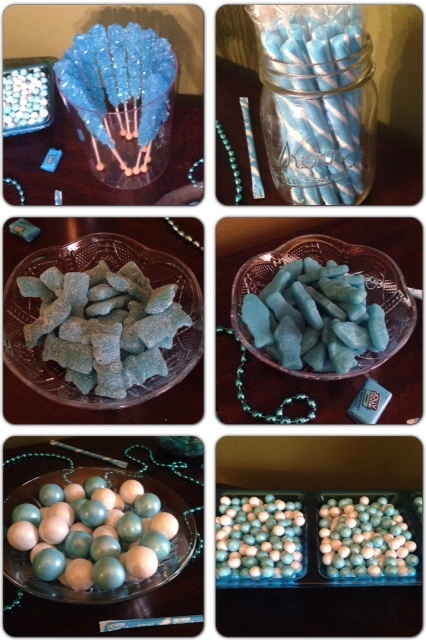 FYI, Sweetworks has the most amazing candies in so many fun colors to match any party theme. The Sixlets are candy coated chocolate and I could seriously eat them by the handful. You can order them online or find them in most party stores. Also make sure you “Like” the SweetWorks Facebook page. This glass Beverage Dispenser from Oriental Trading holds 8 1/2 liters. 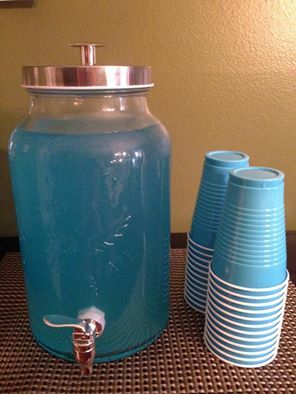 I made “Frost Glacier Freeze” Gatorade to stick with the blue colors in her theme. This actually saved me so much money because normally I buy sodas and the kids end up going through so many and I end up finding “1/2 drank” cans all over my house. I have to say, this was my favorite party I have ever had for her birthday. And to see how excited she was all day just made me smile from ear to ear !!! Disclosure: I was given products from Sweetworks and Oriental Trading for my party. All opinions are 100% mine and not influenced in any way. 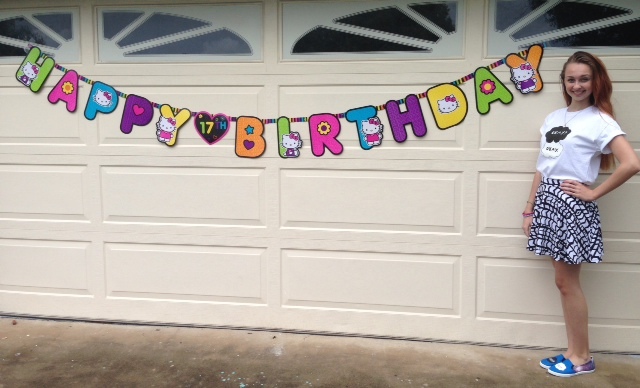 Awww….Happy Birthday Kaley, and good job Mama! The shirt AND shoes match too! LOL Awesome!